Systems and Magic have just launched a new version of their mains conditioning products. The original conditioners were reviewed on TNT Audio in 2008. Kindly, the manufacturer provided examples of both old and new conditioners so that we could make a side by side comparison. Except that side by side comparisons of mains conditioners are nigh on impossible to actually do, given the need to jump up and swap plugs around. This, coupled with the fact that mains conditioners are notoriously fickle in their effects - depending on mains quality, time of day, partnering equipment and so on - made this a potentially challenging assignment. So the first task was to assess the conditioners, see what, if any, difference they made in my system, then compare the old and the new. Before we get on to listening tests, let's have a look at the units themselves. Systems and Magic are an Italian company, based in Rome where they make a range of conditioners with different specifications for different tasks. After discussing the make up of my system, I was supplied with new and old versions of the 2500 and Extreme variants. Each of these has two outlets, with a choice of EU or US sockets although no UK version is available. The 2500 will handle current demands of up to 2300w whilst the Extreme is optimised for less current hungry devices and handles up to 230W (wattages given for 230v). There are also versions with up to eight sockets with various wattage ratings. It is not necessary to have a separate conditioner for each power rating but there are potential performance advantages. The conditioners provide both overload protection and filtering. The new variant provides greater protection against mains spikes- such as that caused by electrical storms - but we didn't test that. They seem exceptionally well made, solid, weighty metal casework with substantial plastic sockets. The components are embedded in resin to minimise any vibration and they are effectively silent in operation. They are supplied with a regular IEC inlet so you can use your choice of mains cable to connect the filters to the wall outlet. I used regular generic cables. Unfortunately, since I am in the UK and wasn't prepared to change the plugs on my equipment it was necessary to use adapters for connecting the equiment to the filters. These restricted me to using one plug in each unit since the adapters I was using made the plugs too wide to sit properly side by side. Of course, if using in the longer term I could have changed to mains leads using Schuko plugs. Although I've never measured it I assume my mains supply is pretty good - I live in a semi-urban environment, not too far from a substation and a good way from any industrial facilities. It's a modern house with decent wiring and the listening room is on its own loop (although the stereo shares its power with TV and DVD kit) and I usually have my netbook plugged in as a source. Of course we do have all the usual gadgets and devices elsewhere in the house - there are seldom less than three computers drawing power from the mains along with a refrigerator and so on, so there is certainly some mains pollution. I have used a Tacima conditioner for a while and recently added a Belkin PF30 but neither makes much, if any, difference to the sound. So I wasn't expecting a lot from the Systems and Magic kit. In fact I wondered if I was wasting my time (cut to the chase - I wasn't)! All the discussion I've read about mains conditioners talk about how the mains are the differentiating factor. It's said that if your mains supply is good enough then you won't benefit from a conditioner. There may be some truth in this but it seems to me that is only half the story. It's also about how good the mains filtration is in the equipment you're connecting. 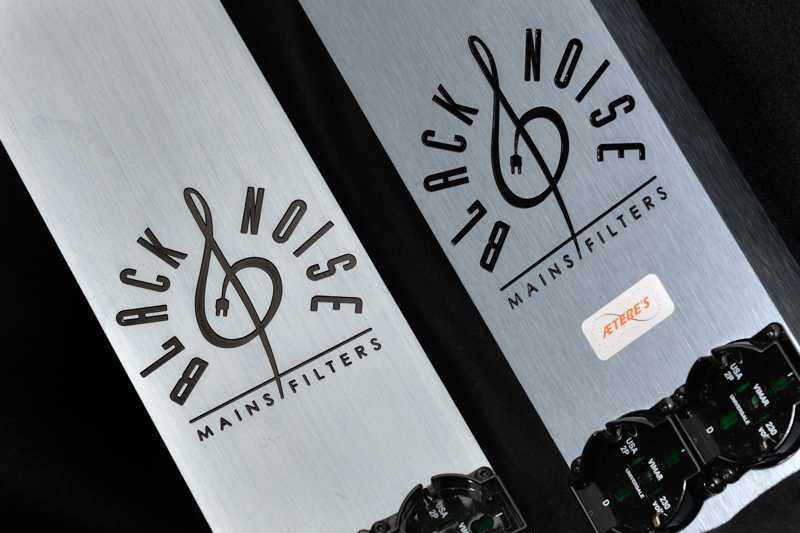 It could well be that if the mains is perfectly filtered by your amplifier and sources then there's no benefit to be derived from separate filtration. On the other hand, if your equipment has shortcomings in this area then it could be that there are advantages to conditioning even if your mains supply is reasonably good. One issue is that serious mains conditioning is not a real budget option so is best considered for systems that are basically sorted and revealing enough to hear relatively subtle differences. OK, for all those provisos, the difference the Black Noise conditioners made in my system, compared to direct mains connection was not really that subtle. If I had to quantify it, I'd say it was kind of half way between a cable change and a component upgrade. The nature of the difference was pretty much consistent with the reviews the kit received when it first launched. I've never noticed much, if any, noise with my system so the conditioners didn't have much to work with in that respect. Having said that, there was not, for me any obviously "deeper blacks". What I did get though was improvement in the definition of the soundstage and the instruments within it. This seemed to be due to improved detail transmission, giving an enhanced sense of realism. It also smoothed out a little harshness that's occasionally present in the upper mid range on my system, removing, for example, the slightest metallic edge from Sharon Bezally's flute on the BIS records SACD of Mozart's flute concertos. The impact on the soundstage was exemplified on the Buena Vista Social Club album. Separation of the vocal tracks was clearer. It was just a little easier to make sense of the mix and the way the instruments settled into it. I've been listening a lot to the first few tracks from Maeve O'Boyle's debut album which sets a breathy vocal in front of multiple distorted guitars. On this, the sound with the conditioner in circuit is more listenable. Without it, there's a return of a slightly unnatural edge to the guitars here and there. It's not a night and day difference - my wife didn't come into the room and scream "Wow! Please buy one of these!" (hmmmm that'll be the day) but most of the time there was a worthwhile difference. It's also worth mentioning that I didn't have any issues with subdued dynamics with the conditioner in circuit (sometimes a criticism of mains conditioning products). Take, for example, the Rachel Z album "Come as You Are". This features some really powerful percussion and stunningly well recorded cymbals. I was half expecting a reduction in the impact from these but didn't notice any compression even on repeated listening. The news is that there's an improved version of the conditioners that will have just reached the market as you read this. It's the first change to the conditioners for eight years so it reflects a lot of learning and development - this is no mere cosmetic makeover. The visible differences are few. The casing is a very slightly darker grey and it now sports a badge with the logo "AEtere's". The new branding reflects the fact that much of the change results from a collaboration between Systems and Magic and AEteres, a new company, described as experts in environmental management and control of electromagnetic effects. The web site is not entirely transparent regarding the contribution made by AEteres but it has certainly been effective. The new edition conditioner increases the effect, giving another step up in definition and size of soundstage. I was enjoying, for example, the recent John Scofield cover of the old Beatles track "I Will", and found it showed more definition in the edges of the guitar tone and a slightly better sense of space. Altogether the magnitude of difference was not quite as great as that between the unfiltered and filtered mains but it was certainly audible in my system. I changed the conditioners over several times over in the time I spent with the products and found I left the new conditioners in circuit for longer than the others - they just seemed to give a greater sense of ease to the sound I was achieving from the main components. These conditioners make a positive difference to the sound of my system even though I'm not aware of any major problems with the mains. They have much more of an effect than the cheaper conditioners I've been using although, quite honestly, I've no idea if they're doing anything substantially different. If not, they are certainly doing it better. The revised version is a definite step up from the original. If it were me, I may not be rushing to upgrade from V1 to V2 (although if I had the budget, I'd think about it) but if I hadn't tried either then the V2 would give a better reason to give one - or more - of these conditioners a try. The following comments are extrated from discussion that Andy had with Roberto at Systems and Magic following publication of the review. It is reproduced here because it provides further insight into the issue of mains treatment in general. "A great deal of misunderstanding comes from "where" the mains noise originates. Most noise comes from the other electronics close by, that's why it does not necessarily matter how "clean" the line is or if it's a "dedicated" one or not. Of course it helps if it is cleaner and it helps if it is dedicated to audio but that's only part of the story. Electricity is not a water hose pouring into a container where it's used up (and that's it), rather a hose pouring into a chain of communicating containers (the audio electronics, but also any other electrical device), one pouring its output into the other and the last one getting back to the source. It's a "ring", a closed chain of events each with a peculiar "imprinting" made by every electric "client" encountered on its way. That's why dedicating different filters to different electronics "breaks up" this chain into smaller and smaller trunks with better and better results. A dedicated line avoids extraneous "clients" becoming part of the inner ring (except, i say again, the audio gear itself) but does not avoid that this ring is part of a bigger one (the home environment), or still a bigger one (the other apartments or homes close by), up to the local facility transformer.... Obviously, the further it is from the audio room the lower this noise becomes, that's why a dedicated line helps to "make a distance" but that's all. Incidentally, this explanation indirectly makes better sense of why (some) sophisticated AC power cords work, they are NOT the last meter, rather (from the point of view of the audio electronic), the very first one. The closer a mains treatment is to the audio gear, the strongest is its contribuition (good or bad) to the sound." "They do, but changing the shape of electric energy is not so easy after all, It goes through several "state" transformations before getting to the speakers. First it is alternate, than DC, then alternate again with a superimposed specific shape... and, if you think, nobody ensures that the "driving shape" that will mold the (now) "shapeless DC" has no artifacts in itself in the first place! After all, that forming shape comes from electricity too... So a particular wave (the signal, which in itself was AC too.. then DC, now AC again...) molds the (now) flat, DC energy, into a bigger and more powerful AC copy of itself in order to drive speakers... quite complicated. Moreover, both the signal source and the amplifier source get the electricity they need from the same outlet, which isn't simply "water pouring in", but its shape is deformed by the same electronics it feeds... and into the ways it is deformed, there is also a close resemblance to the audio signal itself. So electronics shaping the electric signal, shape at the same time the electric mains line used by the audio gear next to it... with both using the same "wave"... even more complicated. What emerges is that the line that separates the raw energy from the polished one is not so neat as we suppose it to be... we just suppose incorrectly!" "It's all energy we deal with, the one we want and the one we want out, but energy doesn't "let go" part of itself easily, and those parts, while much "subdued", play a notable (and audible) part. So... no, I don't have an easy explanation, I'm digging my way into it and it's fascinating all the way :-)"